Our products are made with 100% fish oil, not synthetic chemical imitations. Our scents stay on the baits and lures insuring more aggressive strikes, even under the toughest fishing conditions. 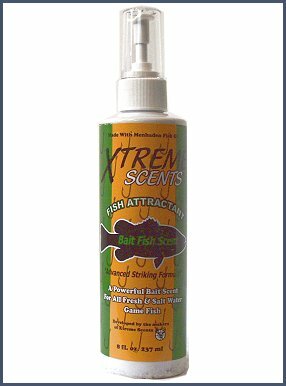 Xtreme Scents Fish Attractants appeal to a fish's keen sense of smell and are extremely effective in dark overcast conditions as well as murky water. Biodegradable and available in 8 oz bottles as shown. Earthworm and Bait Fish Scents.